Using the advertising tab within your HVL dashboard makes it easy for you to set up a Facebook ad. To prepare your ad to run smoothly, complete the following steps first. Add your default city. This can also be a county name or the name of a general area i.e. "East County" or "Southern California"
Add the cities you want to target under name. Background Images: Go to your domain and confirm that the background image is a high quality image. Also, confirm that the images you uploaded for each of your additional cities are high quality images too. The Facebook ad pulls the images from your site. Now let's get started! This document will walk you through ad set up step-by-step. Step 1: Click on Advertising tab in your HVL backend. Step 2 - Click "Facebook Login" to authorize Home Value Leads to access your ad account and pages only. You are not sharing your FB login info with anyone at Home Value Leads. Step 3 - Select your Ad Account and Business Page you want to run an ad from. If you only have one ad account or one page your screen will look a little different. URL to drive traffic to - Your Facebook ad will send traffic to this URL. 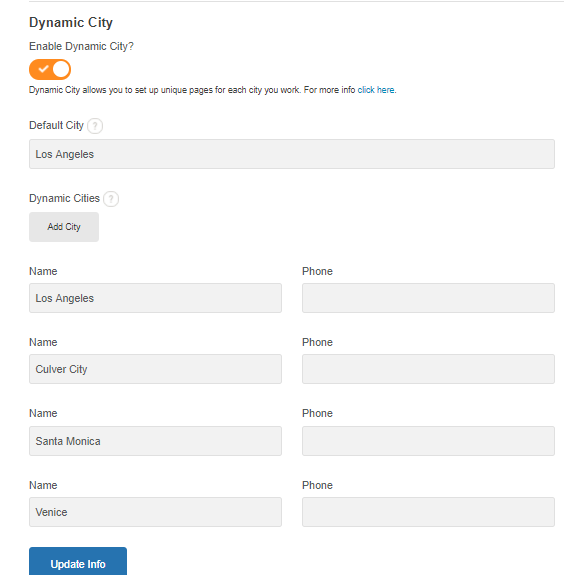 IF you have set up dynamic city, click the down arrow and select the exact city you want to drive traffic to. Only one city is targeted per ad. If you select "City" within the "What X would you like to target" the city name and state will be pre-populated from the URL you select above, as you can see here "Dallas" and "TX" pre-populated. Do not type in things like Southern California or Western Massachusetts. If you change "City" to "Zip Code" it will ask for a zip code and the name of the location. You would type in ONE zip code and then the location name would just be the city that the zip code is attached to i.e. zip code 75001 is in Dallas so we would enter 75001 in the zip code field and then the location would be "Dallas"
What is your Daily Budget: You enter a number equal to what you want to spend on this one ad on a DAILY basis. Must be a minimum of a dollar. We recommend at least $5 and in more competitive areas we recommend $10. Step 4: Click Create and a new line will be added to your advertising main page. It will take a little while for the ad to set up in your Facebook ad account, but at this point you do not need to do anything else to set up the ad. Once the ad is done creating, you will be able to pause/activate the ad from this same page. You will also be able to click the edit button to open up your Facebook ad manager. 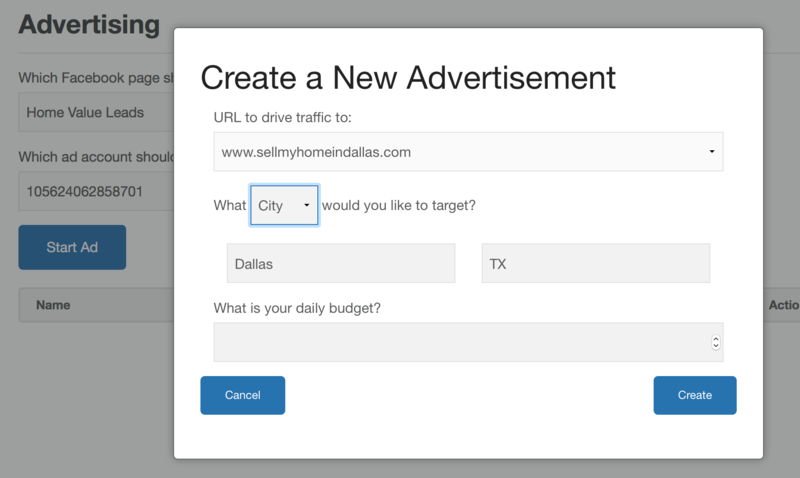 If you set up dynamic cities, you can set up multiple ads targeting each of the URLs within the "URL to drive traffic to" drop down. You can set up another ad by clicking "Start Ad" button.